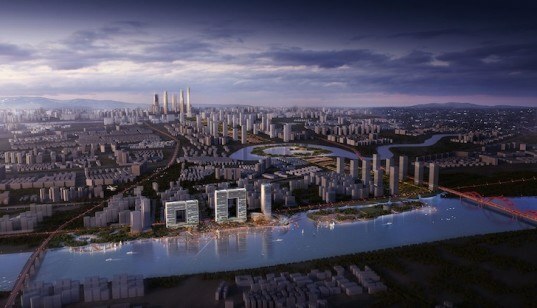 Global engineering and design firm Atkins just revealed designs for Window of Guangzhou, a dramatic three-volume development that will become the new architectural icon for the southern Chinese port city. Set along the Pearl River, the new commercial development comprises a 680-foot-high tower and two window-shaped buildings that symbolize the city’s openness to global commerce. Described as an “unusual” design by Atkins, the buildings spell “001” in reference to Guangzhou’s position as the first city in China to open to international trade. Guangzhou’s location on the Pearl River has propelled the port city into one of the most populous and wealthiest cities in China. Commissioned by China Communications Construction Company (CCCC), one of China’s most powerful state-owned enterprises, Window of Guangzhou’s bold design frames breathtaking views of both the city and the river. “Atkins’ design concept demonstrates the importance of Guangzhou as a gateway to China for the world,” said Shu Guang, project director at CCCC. “The window-shaped buildings promote the city’s image as an important location for China’s import and export business.” To mitigate Guangzhou’s hot and humid climate, the buildings will incorporate sustainable cooling design principles including solar shading and optimized airflow. The development is slated for completion in 2018. To mitigate Guangzhou's hot and humid climate, the buildings will incorporate sustainable cooling design principles including solar shading and optimized airflow. 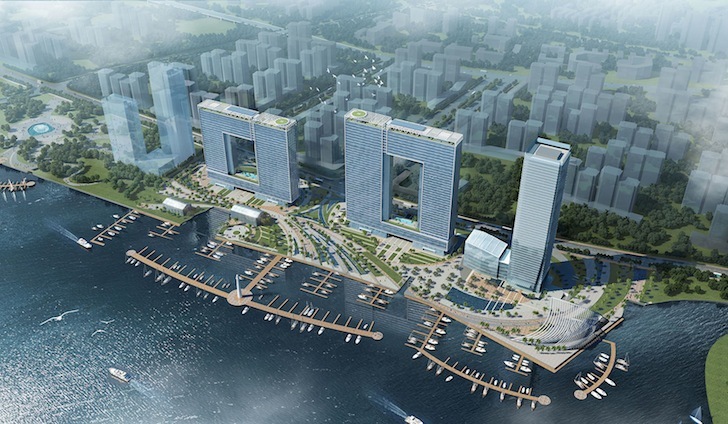 Described as an "unusual" design by Atkins, the buildings spell "001" in reference to Guangzhou's position as the first city in China to open to international trade. Set along the Pearl River, the new commercial development comprises a 680-foot-high tower and two window-shaped buildings that symbolize the city's openness to global commerce. The buildings were commissioned by China Communications Construction Company (CCCC). Window of Guangzhou’s bold design frames breathtaking views of both the city and the river. The development is slated for completion in 2018.